Last Sunday, 3rd April, I went to see Little Mix’s ‘Get Weird Tour’ at the Genting Arena in Birmingham. I only bought the tickets less than two months before the concert because they released some extra tickets for it, and it was a week before my sister’s birthday so I decided to buy the tickets as a surprise birthday present. It was really hard keeping it a secret for that long, but I finally told her a week before the concert and then I could start getting properly hyped up without having to hide it! Despite getting the tickets so late, I actually managed to get us really good seats! We were the front row of block E, the second block back on the floor and it was amazing as we had loads of room to dance around. I am so, so glad I managed to get tickets to this concert because it was hands down one of the best I’ve ever been to! And that’s saying a lot considering I’ve been to well over 20 concerts in my life. They opened with one of my favourites from their new album, ‘Grown’, which is such a feel-good tune and really got the crowd going. Even though the stage was small, they did a lot with it. The backdrop was really cool, it had TV screens and funky lights and images that changed with every song which was awesome and creative, plus their outfits were AMAZING. Talk about figure goals. What’s more, their dance moves and choreography were on point; everything just fit together so well and it was such an impressive all-round show. 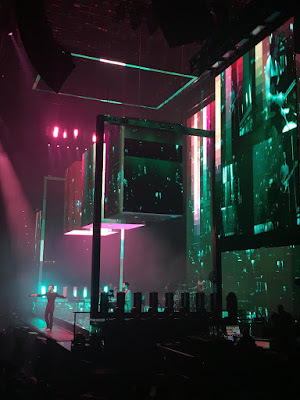 I loved how at short intervals when they would go offstage to do a costume change, they played video clips that told a story which led into the next song, it was just a really creative way of doing it and made it a complete show. My favourite song of the night had to be ‘Lightning’, because of the amazing dance and production that went along with it. The backdrop was in a dark forest with flashing lighting and just such impressive choreography to go along with the song; it was really incredible and made me love the song so much when previously it hadn’t been one of my favourites! Also, ‘Lightning’ was followed by ‘DNA’, featuring a really cool transition from one song to the other and complete with fabulous pyrotechnics (lots of fire!). Although their more upbeat songs got the whole crowd going, dancing and jumping around which is one of my favourite things about concerts, the slower songs were also really amazing and showed off their flawless vocals. ‘Secret Love Song’ lit up the entire arena with flashlights swaying in time the beat, one of my all-time favourite sights, and their acapella song ‘The End’ for the first song of the encore showed just how incredible their voices are, to have no backing track and sing like that, hitting those high notes was truly breath-taking. One thing I always judge the quality of concerts by is the amount of talking the artists do to the crowd and their interaction, and Little Mix truly delivered on that front as well. They’re just really genuine, down to earth and lovely people who care about their fans a lot and that’s what I love about them. They finished the concert with ‘Black Magic’, such a feel good tune that got everyone up and dancing around which is exactly what you want from the final song of a concert; something that leaves everyone buzzing and singing the song on the way home. The concert provided the overall package for me; amazing outfits, fabulous vocals, loads of energy and an incredible atmosphere among everything else I’ve already talked about made it a truly magical and unforgettable night and I hope I get the chance to see Little Mix in concert again as they were really fantastic.